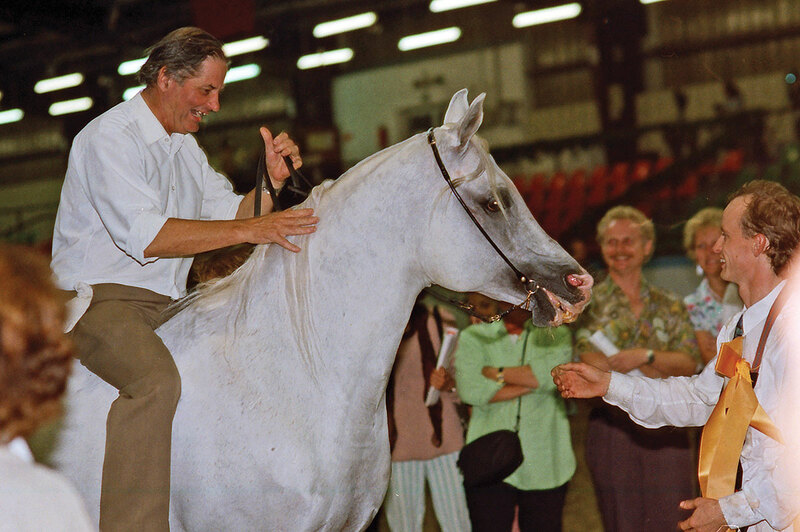 22-year-old Plakat and friends Eric Dorssers (top and middle), and Major Pat Maxwell (bottom), celebrating his final victory at Aachen in 1992. Back in the early 1980s, the show scene was booming across Europe. Those years saw the birth of ECAHO, the European Championships, the All Nations Cup, and the World Championships, and along with them came the first international superstars. 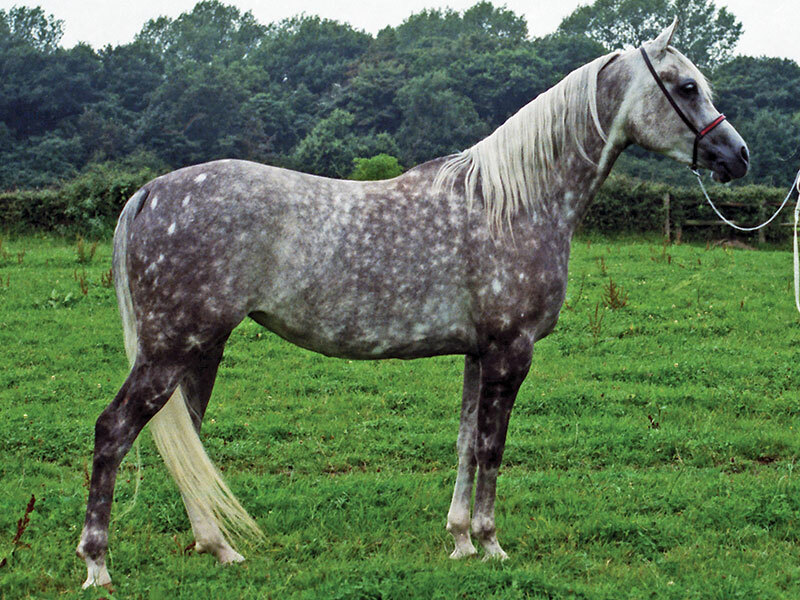 One of the biggest of them all was a radiant white stallion named Plakat. 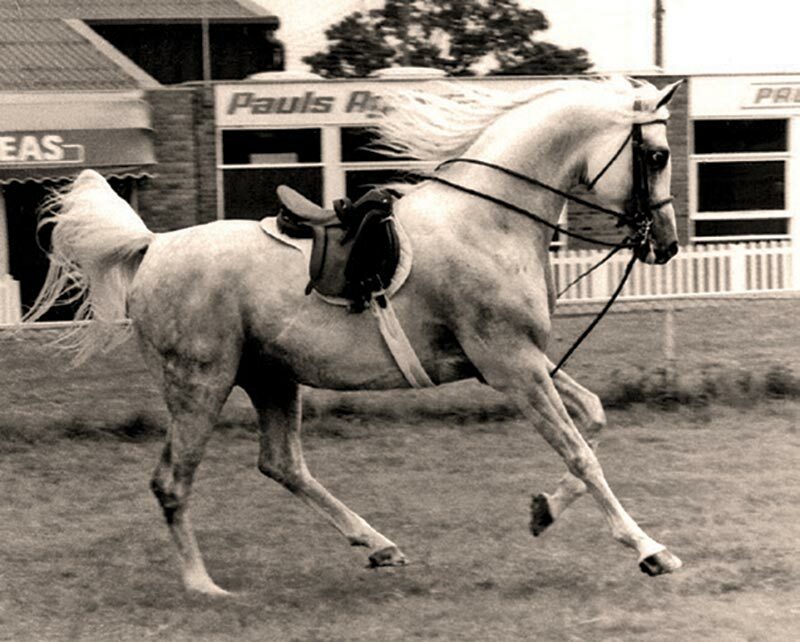 Foaled in the (then) Soviet Union at Tersk State Stud in 1970, by Aswan out of Pchelka, he was the chief sire at Bluebell Arabians in Holland and a true showring phenomenon. He was about as close to perfection as you could get: he had type, he had excellent conformation and legs, and his movements were second to none, regularly drawing a full set of top scores. 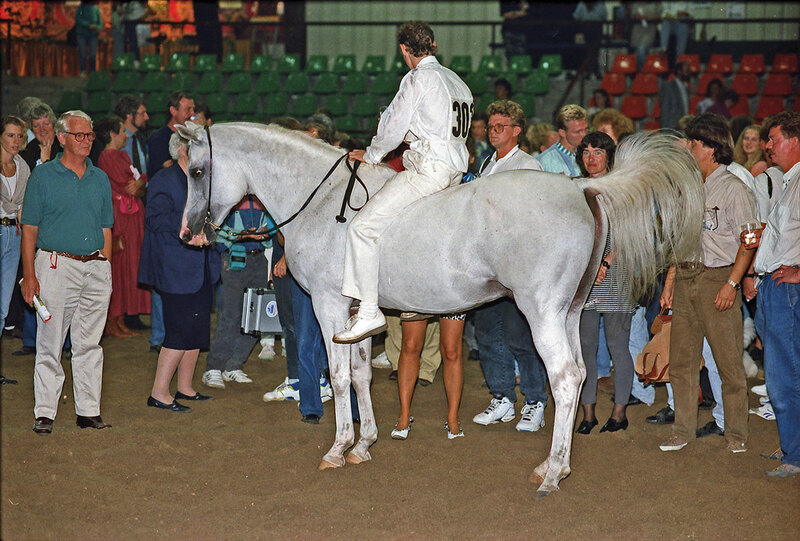 Please note that this was back in the days when show horses were expected to trot a full round without breaking into a canter and/or circling, and handlers could and did run fast enough to make it work. It’s a knack you rarely see today. Plakat’s handler was a young man named Eric Dorssers who could, indeed, run very fast. The two of them began their careers together, and they were and remained an inseparable item. Together, they embodied the living nightmare of all competitors, because they were virtually impossible to beat. How could you? Plakat was very hard to fault, and once he moved, all was lost anyway. You simply couldn’t match that. It even worked if he didn’t show everything he had. Yes, we all know the judges aren’t supposed to know who the horses are, but you could as little mistake Plakat back then as you could mistake, say, Excalibur EA or Wadee Al Shaqab today. He was Plakat. He got his top scores anyway because everyone knew he could move, even if (very rarely!) he didn’t. Maybe there is something to the expiration date theory, at least on an emotional level. It can get a bit exasperating to see the same horse win over and over again, and Plakat won all the time. I have to confess that from a certain point, whenever he would turn up yet again to beat some other horse that I was rooting for, I’d disrespectfully think “Oh no, here comes the marzipan pig again!” I should explain that Plakat was invariably shown in somewhat over-abundant condition. To put it bluntly: he was too fat. It didn’t keep him from trotting up a storm, though. 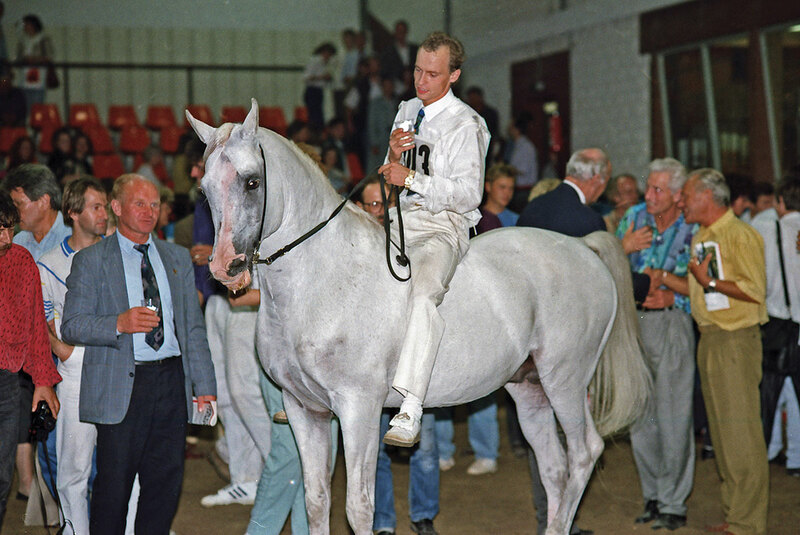 Plakat won his first championship at Aachen in 1983 and remained a firm fixture both at Aachen and other major international shows for four years. In 1987, he won again at the All Nations Cup as well as at the European Championships, and, having won everything you could possibly win, went into retirement at last. After all, he was 17 years old and his sons and daughters had already won World Championships themselves. He had nothing to prove anymore. It was time to give others a chance. 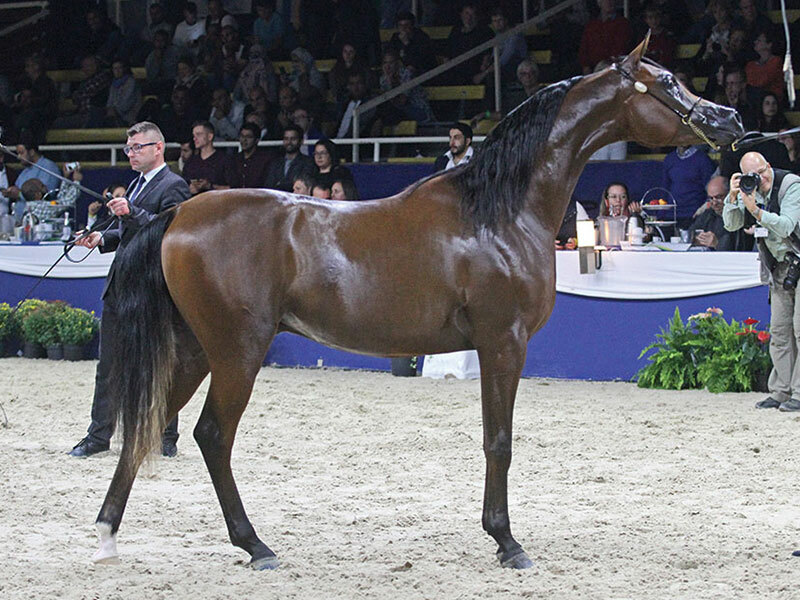 But five years later, when the All Nations Cup came around again, something unexpected happened: Plakat returned to the ring. 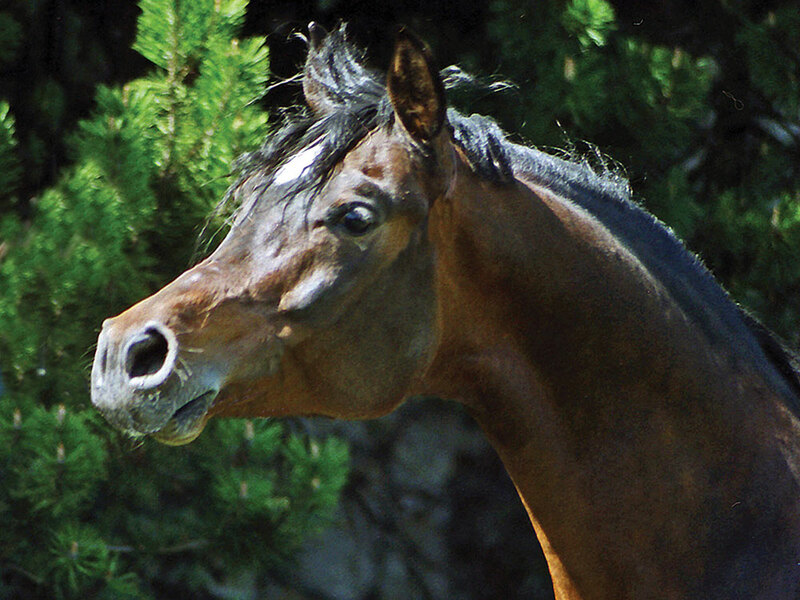 Those of us who spotted his name in the catalog among the senior stallions rubbed our eyes in disbelief. Surely not? He’d been gone for five years. He was — check this — twenty-two years old! It had to be a mistake. But it was no mistake. The last class of the show, and there he was, of course with Eric Dorssers. A vision in white, as before; and yet unlike before, because for once in his career he was truly in perfect condition, not an ounce of surplus fat on him. He looked nothing like twenty-two. He moved nothing like twenty-two. He was Plakat, he was the king of the ring, and the king had come back to claim his rightful place, which was head and shoulders above everyone else. He did it. He beat the entire lineup of top stallions that had come to rule the ring after him. And everybody, but really everybody, cheered like crazy. 25 years ago was truly an occasion to remember. It also proved what the old adverts for a certain brand of Scotch Whiskey used to say, that “you can take a white horse anywhere.” You certainly can, when it is an Arabian! On this unprecedented high, Plakat retired from the showring again, this time for good. I saw him one more time, six years later. After his owner’s death, he had found his final home, appropriately, with Eric Dorssers. When I last saw Plakat in the winter of 1998, he was fat again, as well as shaggy, dirty, and happy. He didn’t look like twenty-eight. His back was straight, his legs sound, his eyes bright. I’m sure that after a good clean-up, he could still have beaten a lot of younger horses. But why should he? He’d been there, done that, got the trophies. 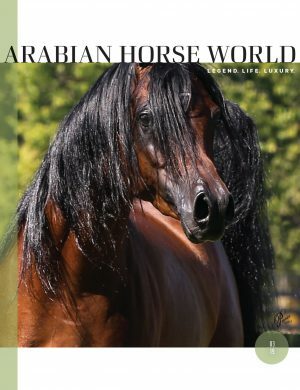 If any horse had earned an honorable retirement, it was Plakat: the perfect example of everything a champion can and should be, with all the essential qualities of an Arabian horse. This especially includes those qualities you don’t see on the surface: soundness, disposition, longevity. Without those qualities, success on a scale like this would have been impossible. But they don’t appear on any judges’ score cards, so it is up to the breeders make sure they are not forgotten. After all, without them an Arabian horse is no more than a pretty face — a pretender at most, never a king. Plakat was a king, one of the first and — to this day — one of the greatest.